Tres Navarre, private eye and sometimes English professor, is hoping for a laid back working vacation when he accepts a summer teaching gig at the University of Texas at Austin, even if it means shacking up for six weeks with his big brother Garrett, who calls Austin home. Garrett Navarre — computer programmer extraordinaire, Jimmy Buffett fanatic, and all-around eccentric — is hoping to retire a multi-millionaire by the end of summer, thanks to a high tech start-up company he and two buddies have launched. Garrett has bet everything from his career to the Navarre family ranch that the company will stay alive long enough to make a public stock offering, allowing him to ride the Austin high tech boom right into the saddle of luxury. Tres and Garrett’s hopes are both shattered with a single gunshot. Garrett’s oldest friend and business partner turns up murdered at his lakefront home, and Garrett is the only suspect. As Tres delves into Garrett’s bizarre world to find the truth behind the murder, he comes face to face with the damaged relationships, violent lives, and billion-dollar schemes of a brave new high tech world. Among the players: Matthew Peña, a corporate take-over artist with a trail of broken enemies in his wake and an overzealous desire to make Garrett’s company his own; Ruby McBride, the victim’s wife, a hard-edged beauty haunted by three generations of family failure; and W.B. Doebler, the head of an oil-rich clan with more power than morals, and enough skeletons in the closet to man a ghost ship. 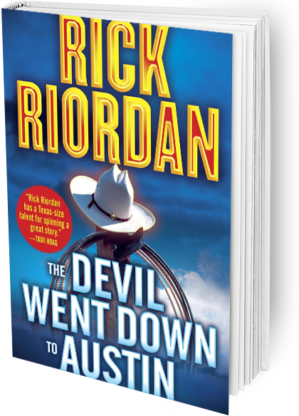 Connecting them all – the beautiful waters of Lake Travis, and an unspeakable evil that lies beneath their depths.